It’s late at night when I get the phone call from Lily Leahy. She is as excited as I am about the 2 seconds of footage and what it shows. She too has watched it over and over again, slowing it down, stopping it at the crucial moment. Taking another look. Who could have known a small dead animal hanging there limply would generate so much excitement between two conservationists. But it is the implications of the dead animal being carried in the mouth of this devil that has got us talking tonight. Why? Because never before have we seen such a thing on our cameras. Devils don’t need to carry their food around, you see. They can eat up to 40% of their body weight in 30 minutes – quiet an impressive feat! So there is no need for storing food unless….. Of course…. you have babies in the den that can’t go and collect it themselves! It looks like what we have here in Julia’s Forest is a mother devil taking food to her young in the den. The excitement turns to worry, as I flick through footage and dates and data in a state close to panic. What was the date of on that footage? December 12th 2011. No, oh no. What camera was this seen on? 1.1? Yes, defiantly 1.1- there is no denying the reality. Six hours later, machines would be moving in as logging begins within 100 meters of this location. I hope she made it back to the den. I hope the babies are safe. “If devils were denning close to where logging is happening, this would cause major disturbance, including from noise and vibrations from machinery. Devils are particularly sensitive to unfamiliar noises, as their hearing is exceptional, so any loud noises are likely to disturb them” Colette said. The real problem seems to be a lack of research. From talking to Colette and others who work with devils, there just hasn’t been enough research done to establish the full impact that forestry operations would have on den sites. For the industry to continue to decimate potential devil dens without even knowing fully the impact this will have is inconceivable, when considering the very real threat of extinction that may be facing the species. “There is no doubt that there would be devil babies buried when machines move into new areas. Because there are currently no laws or proscriptions requiring Forestry to meticulously check areas for devil dens” said Colette. We talked about what might happen to the devil seen on our camera, and to her babies. Even if she realised something wasn’t right and managed to get the babies out of the den it may be very difficult for them to survive. Relocating them at that age is problematic because they are too big for her to carry. And if they are in a state of fear due to un-known noise disturbances they may react unpredictably. There is also the very real problem of finding a new home. Devils seem to be picky when it comes to finding the right den, because there are specific conditions that need to be meet in order to keep the babies safe. For example an ideal den has small side-chambers for the pups to hide in to keep them out of reach of danger. Devils rely on old wombat burrows, caves, or other ready-made homes and these can be in short supply, and can be especially hard to find in areas where borrowable soil is limited. “Unless the mother already knows of another possible denning site, it would be very difficult for her to relocate the babies quickly” Colette said. According to David Owen and David Pemperton: “Habitat interference affects animals by altering the refuges where they breed, raise young and rest. For the devil this could be critical. Maternity dens are carefully selected to provide a safe haven from the elements and from scavengers. Young devils get cold easily and need the warmth from their nests and the sun. Favored dens are strongly protected and may have existed for centuries. Destroying them through, for example, land clearance, disrupts population stability” (Owen and Pemberton 2005:76). Despite these concerns, Forestry Tasmania is taking no action to ensure the safe survival of the devil seen here on our camera, or her babies. We have not seen any devils on film since the logging started and we can only hope that she has managed to relocate them to safety. 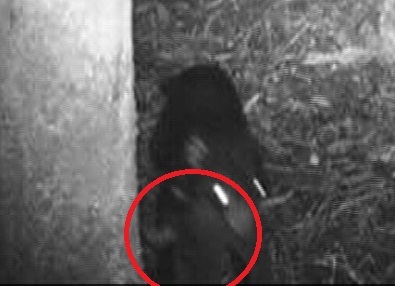 It is hard to tell from the brief glimpse of her on this footage if the mother devil is Davina or a different devil, though it seems like it could be a different one. We will keep putting out the remote sensor cameras and see if we see her again. In the meantime, I guess it’s time to really put the pressure on the government, Forestry Tasmania and Ta Ann to stop the destruction of devil habitat before Tasmania loses another iconic species forever. Owen D and Pemberton D (2005) Tasmanian Devil: A unique and threatened animal. Allen and Unwin Publishing: Melbourne. Posted on December 30, 2011, in Daily Blog, Fauna Videos, Videos. Bookmark the permalink. 8 Comments. http://www.dpiw.tas.gov.au/inter/nsf/Attachments/LJEM-8B2U7E/$FILE/Draft%20Tasmanian%20Devil%20Recovery%20Plan.pdf but all funding seems to be available to the STTDP. FT has a ‘sustainability charter’ stating it is to “implement specific strategies to protect threatened species and their habitats” (s1.3). Has forestry Tasmania given any response to the potential for devil mortality during forestry operations? Also, should the federal minister for the environment be alerted to the impact of habitat disturbance and possible casualties? I have often wondered with he devil being nocturnal whether there isn’t an issue with clearfell operations. Im not sure if each and every foot of bush can be checked prior to ensure no ground based habitat is present and unoccupied. I hope she and her pups are safe. Thank you Miranda for this informative piece and your insights. Love your work and Lily’s and great you were able to consult with Colette. Each of Miranda’s posts knocks me out. We all of us who are pro flora and pro fauna are contributing so much locally and implicitly, globally. We all love the experience of contact with wildlife. Devils don’t come knocking on your door while you’re up with the TV on. Well, they might, but you won’t hear them or see them. More likely they are around after you’ve gone to bed. You see their scats in the morning. I don’t see so many scats around these days in Liffey. (my place on the G. Western Tiers) In fact, the local devil population might be gone. This is really a sad proposition. To think that the devil, which for years cleaned up carcasses etc in the bush, and even on the roads, is now extinct in Liffey, is just so sad. There was a Tasmanian emu – it didn’t last all that long after we Euros turned up. There was the marsupial wolf – we killed it remorselessly. We kill our flora and fauna in other ways. For example, the CARR (Comprehensive, Adequate and Representative Reserve system) seeks to pretend that our species are safe as long as they are ‘protected’ in certain defined areas. They can be annihilated in other areas, but they will still be deemed to be protected In the whole of Tasmania if in locations A, F & Q they are protected. There they are protected. Therefore they are protected ‘in Tasmania’. Therefore we don’t have to worry about wiping out local populations in B, C, D, E … G, H, I J and so on. That’s government and FT thinking for you … open slather. The case of the Tasmanian Devil is particularly important. Here we have an animal under attack from a tumour which it is suggested was created by the matrix of logging in the NE, chemical spraying and some chance alignment of the stars of possible causation. How is the CARR system going to help the Devil? Why is their habitat ( Mt Mueller environs) being logged? This is wrong – devils need protecting. All in all, our government and our forestry business enterprise, have some serious explaining to do. We need to stop logging our native forests. Happy New Year from the Great Blue Mountains World Heritage Area! May 2012 be a break-though for all our young people trying to convince older generations the virtue of mature respect for our fragile natural world. May 2012 see Tasmania’s endangered 432,000 hectares be nationally protected and commence a journey toward World Heritage listing status. Thanks again for your leadership Miranda.